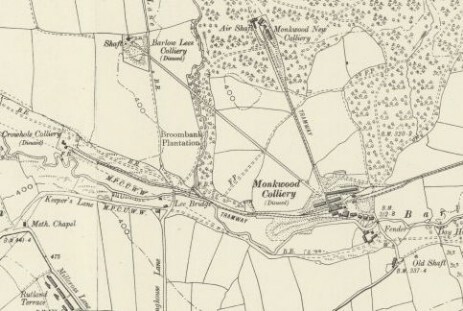 From the older Ordnance Survey maps of this area the local collieries of Monkwood No2 or New Monkwood and Barlow Lees colliery were served by a tramway network. Also along the Barlow Brook valley bottom ran a tramway which served Crowhole colliery. Ordnance Survey 1899 showing Crowhole Colliery as disused, Barlow Lees Colliery as Disused Monkwood New Colliery in use. All collieries fed or did feed by tramway to Monkwood Old Colliery (Disused) and then on towards Sheepbridge by the Sheepbridge Branch line. A large marker stone marks the point where the tramways converge near to Old Monkwood (1). SK. 36/37. 349755. See below (26th March 1870) as to how the tramway was operated. It may have been that because two of them were on an incline, Lees and Monkwood the full tubs of coal would traverse down the incline by gravity and pull up materials and empty tubs on another parallel tramway. The second was used when there was no incline such as between Crowhole and Monkwood which could have been a static steam engine pulling a chain or rope haulage system network with a return wheel at the end of the tramway. Tubs could be clipped on or off the continually moving loop of the chain or rope. In l763 a lease was granted to John Barnes the farmer of Brampton for an existing colliery in the Barlow area, the lease was for twenty one years at an annual rent of £105 per annum, which was normal practice for the era. The lease was signed by Robert Harley, James West and Margaret Cavendish daughter of the Second Earl of Oxford. (This original lease can be viewed as part of the Barnes Collection in Chesterfield Public Library). The lease and land passing on from the Harleys to the Second Duke of Portland on the marriage of Margaret Cavendish to the Earl Duke of Portland. Only two pits were allowed to draw coal at any one time but as much coal as possible could be extracted from each pit. Old pits had to be filled in and the land returned to its original state. Any subsidence caused by the mining operations had to be paid for or put right and access onto other peoples land (trespass) had to be paid for. The lease is signed and dated August 1st 1763 and production startd from the collieries in November that year. The first shaft was forty eight yards deep and was sunk by the contractors Peeler Booker at a cost of ten shillings and sixpence per yard, with expenses. These being, one shilling and sixpence for gunpowder and four guineas Blacksmiths expenses for repairs to the boring rods. Another shaft was sunk to a depth of forty nine yards and two feet. More shafts were sunk over the period 1766-1786 at a cost to the Barnes family of between nine and twelve shillings per yard. The collieries worked the longwall system which originated in Staffordshire and was capable of producing around 250 tons of coal each day. The coal was carted from the pit head initially by the local company of Bramwell and Company. Who also sold it for the Barnes family. A unique record of the mining expenses was kept by Barnes during the life of the collieries. On the 10th. November 1774 a workman was paid two shillings for breaking a lump which fell on and killed Gilbert Booker. Wages of the day were (1744-1746) for hewers and drivages around one shilling and sixpence and (1776-1779) one shilling and eight pence per day. Miners names were recorded in the book for receiving certain one off payments for work done out of the ordinary. Joseph Renshaw (1765). Moses Tagg (1776). And John Crooks. During the period 1772-1776 expansion work was carried out on the mines because the Highfields section was nearing exhaustion and in 1776 shafts were sunk at nearby Sudbrook with drifts being driven between the mines by Moses Tagg which would suggest that the extent of the workings needed improved ventilation as the single shaft system was inadequate to supply the needs of the miners. Money was also spent on improving underground roadways and transportation. At the first Barlow pit a gin winding engine was constructed. A gin being a tripod construction with a winch for the winding engine. This was complimented in January 1777 when a dam was constructed and a 'fire engine' (Steam engine), was built to drive pumps. Water wheels were also employed to drive crank driven pumps at the collieries. The steam engine cost £275.16s.6d. To construct using many second hand parts, the boy who was put in charge of the engine was called George Stevenson. The costs involved with the sinking of the shafts, opening up the mines and installing the engine was £545.3s.6d. Which was quite a loss for the family from 1763-1769. The family also had mines at Cutthorpe, Brampton and Baslow, the land on lease from the Duke of Devonshire at Chatsworth on the north side of the estate housed a drift mine sunk by Booker and Co. to mine domestic coal for the estate. Interestingly, during the 1912 strike the old pillars of coal left in the mine were worked to supply coal for the heating of the greenhouses on the estate. The Barlow roads were part of the national packhorse routes, passing over Lees Bridge and on to Dronfield and Sheffield and coal in small loads could be transported in this way to and from Chesterfield and the surrounding area. Coal mining continued in the area from these small beginnings, the collieries became larger as the need for coal increased and this led to the construction of the Monkwood branch line from Chesterfield (Sheepbridge) on the main Derby to Sheffield line in 1850. An earlier plan of 1824, The Grand Commercial Canal was to link the Chesterfield canal to the coalfield and then through to the Cromford canal at Cromford, these ambitious plans were part of a proposed great expansion of the countries canals which failed due to lack of financial support. By the 1840's the railways were the way forward. The Barlow coal was peculiarly free of sulphur and thus ideal for use in steel making or for Coke and steam coal. The collieries in Monkwood at Barlow produced coal at Barlow Lees colliery and the New Monkwood colliery and transported it then by tubs on a tramway from each of the two collieries which were 900 yards and over a mile away respectively and which converged at the Old Monkwood colliery where it was unloaded onto the railway branch line for transportation. In line with other colliery companies the Monkwood colliery company built miners cottages a Barlow, Rutland Terrace and school was built to house and educate its workforce, the two storey row of houses overlooking the woods which hid the collieries. Other miners lived on site at the Old Monkwood (Number one) colliery up until the collieries closure in the latter half of the 1890's, now a farm. In June 1880 there was an unsuccessful strike over wages, Monkwood wages were less than those at other collieries and this may have been a reflection of the financial situation of the company as the Monkwood colliery company (Barlow Furnace) failed with debts of £33,000 in 1881. The collieries closed finally in 1898 on February 11th. As a result of the recession in the coal industry, most of the men had transferred earlier to the Grassmoor collieries owned by the Barnes family. Monkwood Collieries were owned by J.C.Plevins 1862-1865, then Monkwood Colliery Company 1866-1880, then J.C.Plevins, Managed by William Hill. Monkwood Plevins may possibly be one and the same company Late in 1874 the Durham Miners Association sought to buy Monkwood as part of a joint stock company under the guise of the Co-operative mining company. The mines may have reopened in the early part of the twentieth century from information given to me by the late Mr. George Siddall. He recalls how his father left his tools at the mine on a Friday never to see them again because the mine flooded over the weekend causing it to be permanently closed. Monkwood new Colliery (2) Sunk through the Cockleshell coal at 30feet, Low Tupton at 85 feet, Blackshale at 296 feet, Ashgate at 309 feet and the shaft bottomed at 319 feet. Area has now been landscaped. Monkwood Old Pit. Monkwood No 1. Sunk through Blackshale coal at 199 feet and the Ashgate at 247 feet. Monkwood Colliery - the opening of the new shaft at Barlow Lees. Derbyshire Times 26th March 1870. One of the most noticeable steps in advance in the immediate neighbourhood of Chesterfield has been that of the Monkwood Colliery company which has just sunk a new shaft in furtherance of the extension of the workings and has laid down a tramway of unusual character from the mouth of the pit to the railway which runs through the Dunston Valley, joining the Midland line at Lockoford. The colliery has been worked by two shafts and it was deemed advisable by Mr. Bell the experienced manager of the company to sink a third shaft about half a mile north of the old pits. The shaft was commenced on 17th August 1869 and the company commenced to draw coal out of it on the 20th January 1870. The total depth of the shaft is 63 yards and it is bricked throughout and is fitted with wire guide ropes instead of the old wooden conductors. The cages (it is a double shaft) weight 10 cwt each. They are suspended with steel wire ropes and worked by an engine of 40 h.p. Built by Oliver and Co. having a flywheel of 12 feet in diameter. The 40 h.p. Boilers were built by Mr. Arnold of Chesterfield. Between the old workings and the new pit which is situated at Barlow Lees there is a tramway which is worked by an endless chain passing round a windlass drum and round a flywheel at each end. As soon as the workmen at the new shaft have filled a corve they work a signal wire to the engine man at the main pit who is 900 yards away and when the chain is in motion the empty corves come up as fast as the full ones go down. It seems that further extension of the workings were needed as in January 1875 another pit was to be sunk at Monkwood. The sinking was to be let; the shaft was 60 yards deep with no water to contend with. The contract was to be allotted by Mr. Dixon the colliery engineer. James Mee and William Riddle were charged with having whilst working 160 yards from the pit bottom pipes and tobacco in their possession. Fined 10/- with costs. Derbyshire Times 5th January 1876. Good stall men can have constant employment at Monkwood colliery Barlow. They can have houses at the colliery if they so wish. Derbyshire Times 27th October 1864. This walk covers a few miles and was originally written in 1990, some things have since changed but it is basically the same walk. The starting point is at Lea Bridge around SK 36/37 344754 it is worth noting the inscription under the bridge on Keepers Cottage side, you might have to get your feet wet to see it. The bridge was once part of the local pack horse route to Sheffield and Baslow. A Thirdbaro was a keeper of the peace or a constable third in line in the local command structure. John Ingham was the mason who built or rebuilt the bridge under the command of Hugh Rippon the constable in 1722. Walking from Lea Bridge with your back to the cottages walk to the right towards the small footbridge turn left as you cross over the wooden bridge and bear left and follow the brook on your left is a small square stone building which is possibly the remains of an old sheep dip and a small stone built bridge over the brook, the bridge is made of local stone and it diverts the original footpath over the brook as it comes down from Monkwood colliery. At this point the footpath becomes much wider and appears to be stone paved. On the path at 343759 is an embankment lined with local stone this is the remains of the tramway bridge which carried the coal over the footpath from Barlow Lees colliery to the Old Monkwood or the number one colliery. The footpath is now about twelve feet wide, wide enough for carts and ponies and a little farther on; on the right is the place where the stone for the tramway bridge and footpath was quarried. The footpath climbs uphill and ends up at the colliery. The remains of New Monkwood or the number two colliery are at 346760 and are raised about fifteen feet above the ground level and the elevation is built by utilising shale and coal waste. The air shaft feeding to the ventilation chimney can be seen it is constructed out of six and a half foot brick arching sat on top of blocks of stone. (This is now filled in as the roof was collapsing). The upcast shaft is about five feet deep now, red brick lined and about eight foot in diameter. Evidence of other brick and stone buildings can be seen and a little further uphill is the downcast shaft. Off the steepest edge of the hill over to the fields was the other tramway that took the coal from here to the number one colliery. The shafts were over 300 feet deep. The colliery is shown as disused in 1919 and not present on maps of 1876. The colliery may have closed around 1881 when the Monkwood colliery company failed. It is also possible that the pit was mothballed and reopened later on. There is little to identify that Monkwood number one colliery at 349755 ever existed but the fields at the back of the timber yard once housed several railway sidings for the Monkwood branch line and the coal was loaded here from the collieries that came via two tramways. A walk down the branch line starts from the timber yard, cross the road and you will see that the first part of the old line has been made into a road. The line is well defined with the remains of many rotting rail sleepers are lying about, the walls that bound the line are made from grey-white boulders of slag from the iron or steel process and are now discoloured with age. Off the line comes the Nesfield branch line that serviced the Nesfield colliery nearby. This is a pleasant walk that unfortunately terminates at the Sheepbridge industrial estate. Derbyshire Times. March 18th 1871. Adoption of the Industrial Partnership System at Monkwood Colliery. It is becoming to be generally recognised that the combination of capital and labour is highly conducive to the success of any mercantile concern. The principle of any industrial partnerships introduced sometime ago by Mr. Briggs has been found to work so well at the Whitewood collieries and other places that about 12 months ago Mr. Emmerson Bainbridge manager of the Duke of Norfolk’s Sheffield collieries resolved if possible to adopt it at the Monkwood colliery near Chesterfield. The Monkwood Colliery Company have just sunk a new shaft in furtherance of the extension of their workings and have laid down a tramway of unusual character from the mouth of the pit to the railway which runs through the Dunston Valley, joining the Midland line at Locoford. The colliery has been worked by two shafts, and it was deemed advisable by Mr. Bell the experienced manager to the company to sink a third shaft about half a mile north of the old pits. The shaft was commenced on 17th August 1869 and the company commenced to draw coal out of it on 20th January 1870. The total depth of the shaft is 63 yards and it is bricked throughout and is fitted with wire guide ropes instead of the old wooden conductors. The cage (it is a double shaft) weighs 10 cwts each. They are suspended by steel wire ropes and worked by an engine of 40 hp built by Oliver and Co. having a flywheel of 12 feet in diameter. Mr. Arnold of Chesterfield built the 40 hp boilers. Between the old workings and the new pit which is situated at Barlow Lees there is a tramway which is worked by an endless chain passing round a windlass drum and round a flywheel at each end. As soon as the workmen at the new shaft have filled a corve they work a signal wire to the engine man at the main pit who is 900 yards away and when the chain is in motion the empty corves come up as fast as the full ones go down. To let the sinking of a pit at Monkwood colliery. Depth to be 60 yards and there is no water to contend with. Apply to Mr. Dixon Engineer. James Mee and William Riddle were charged with having whilst working 160 yards from the pit bottom pipes and tobacco in their possession. They were fined 10/- plus costs. The Devonshire Silkstone Coal Company Ltd. Capital £30,000 in 3,000 shares of £10 each. This Company is formed for the purpose of winning an extensive field of Blackshale seam of coal upwards of 800 acres. Situated about three miles north of Chesterfield and leased from The Dunston and Barlow Ironstone Company for a term of thirty-four years at £200 per acre. The Midland Railway’s Company new branch line from Sheffield passes through the estate and it is proposed to sink two shafts as near to the railway sidings as possible. On Thursday night last a serious explosion of gas took place at the Devonshire Silkstone Colliery when three men were severely burned. Last photograph, Barlow School and Miners Row. (Rutland Terrace). Barlow Monkwood Collieries and Their Tramways. This is where the tramways from Barlow Lees and Monkwood No2. Enter the railway sidings on Monkwood Old Colliery. Photograph was taken late evening and is looking upwards towards the collieries that were in production. A large marker stone marks the point. SK. 36/37. 349755. Haulage on an Inclined Plane. A stationary steam engine at the top of the incline drives a winding drum that hauls the wagons containing materials for use at the mine through a steel braided rope or (chain) with a hook on the end. The rope was attached to the tubs. The engine could also provide braking for the descending full coal tubs. Only a single track and cable is required for this type of haulage. As the haulage runs down rope is fed out from the coil on the drum, upon its return the rope is coiled back on to it. In modern mines this type of haulage was used to supply materials to the coal face and was called a Pickrose Hauler powered by electricity or in other mines compressed air. At Markham colliery they were used on short runs only such as pulling materials off the chair, up to the coalface or round corners. A second variation was used which utilised a static steam engine pulling an endless wire rope or chain haulage system with a return wheel at the end of the tramway. Tubs could be clipped on or off the continually moving loop of the rope. You would only need one track (or one track with a passby if you were hauling up and down at the same time). This type of haulage was widely used underground driven by various forms of electrical drives even in the more modern mines of the twentieth century until replaced by battery locomotives or diesel free steering vehicles. It also provided the basis for manriding underground for many years in various guises. This system was a more permanent addition to a colliery. Some form of signals would be employed to inform the engine driver of the requirements of the men in charge of the train of tubs and on long runs rollers would be set at regular intervals to improve friction. In a gravity balance system two parallel tracks are employed with ascending set of tubs on one and descending set on the adjacent track. A single endless rope or chain is attached on to both trains, wound round a braking drum at the top of the incline to provide braking. The weight of the loaded descending tubs is used to lift the ascending empties. This form of cable or chain railway can only be used to move loads downhill and requires a wider space than a stationary engine driven incline, but has the advantage of not requiring external power, and therefore costs less to operate. This system can also be run with a steam or electrical system to add extra pulling power. Many mines used pony drives underground so, as the animals were used underground they would have been utilised on the surface as well for the transport along these tramways. An old well tried and tested system which may have been used here.